Sarah (Saraswathi Devi) introducing Surya Prakash and his newly wedded wife Bhavani during the press meet. 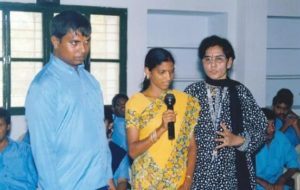 26-year old Botta Surya Prakash is lucky to marry malla Bhavani, a normal person on 12-02-2005. Surya Prakash who is receiving training from Lebenshilfe for the past 19 years is presently attending the sewing section to learn the technique of stitching dresses etc., as part of his vocational activity. Being an arranged marriage he has not faced any problems with regards to his wedding proposal. Bhavani wants to continue her services as a nurse in private nursing home. But the family of Surya Prakash asked Bhavani not to attend her job and restricted her to stay at home only. Surya Prakash says he wants to continue, coming to Lebenshilfe to learn sewing and tailoring work to earn some money to take care of his wife. That is his hope. His wife Bhavani says she has married Surya Prakash, though a mentally retarded out of her willingness. She said, ‘Surya Prakash sounds an innocent person and does not know many things as other normal persons in the society. However I married him with a hope that I can train him to obtain considerable change suitable to lead a normal married life.’ That is her confidence.